Inside this cottage are the remains of a late medieval hall house open to the roof, with a crown post and beam dating from about 1490. There are traces of smoke blackening on some of the timbers, as there would have been no chimney and smoke had to escape through a hole in the roof. Some of the original timber frame of the house can be seen on the side wall. The Sibley family lived at The White Cottage for about 250 years. 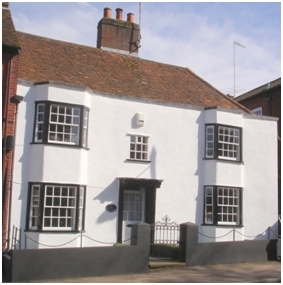 The frontage of the house was rebuilt in about 1630 by Francis Sibley, who also owned the Bell and Crown public house (the site is now The Crown House at 27 High Street) On his death an inventory was drawn up for the house, which included his 'joined' chair, his bookshelf and 'some few books', and, from his kitchen, six brass kettles, brass pans and skillets (pans with long handles, and short legs to stand in the ashes), '3 dripping pans, a Tin colander, Tin apple roaster and Tin pudding pan'. The frontage was rebuilt again in 1763, this time by (another) Henry Sibley.